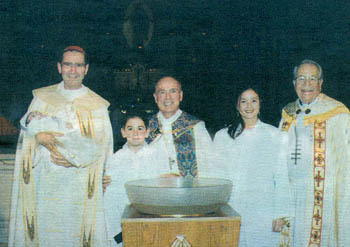 Religious Indifferentism - Above, Cardinal Roger Mahony, Episcopal bishop Frederick Borsh and Evangelical Lutheran bishop Paul Egertson posed together with newly baptized members of their respective confessions. The multi-faith ceremony took place at St. John's Episcopal temple in Los Angeles, November 19, 1995. 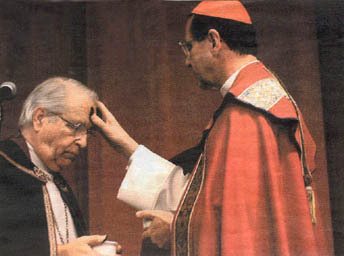 Below, he placed Holy Ashes on the forehead of Lutheran bishop Paul Egertson, March 8, 2000, at the University of Southern California, Los Angeles. "Whosoever spontaneously and consciously in any way helps the propagation of heresy, or communicates with heretics in religious ceremonies.... is suspect of heresy" (Canon 2316).